Introduction:Edward O.W. Whitehouse, “Wildman Whitehouse” as he generally styled himself, was a surgeon by profession and an electrical experimenter by avocation. In 1856 he was appointed chief electrician to the Atlantic Telegraph Company and was responsible for the testing of the 1857/58 cables, and for the design and operation of the equipment which would transmit the telegraph signals between Ireland and Newfoundland. While there were other factors, the historical record generally reports that Whitehouse’s insistence on using high voltage induction coils was ultimately responsible for the failure of the cable. 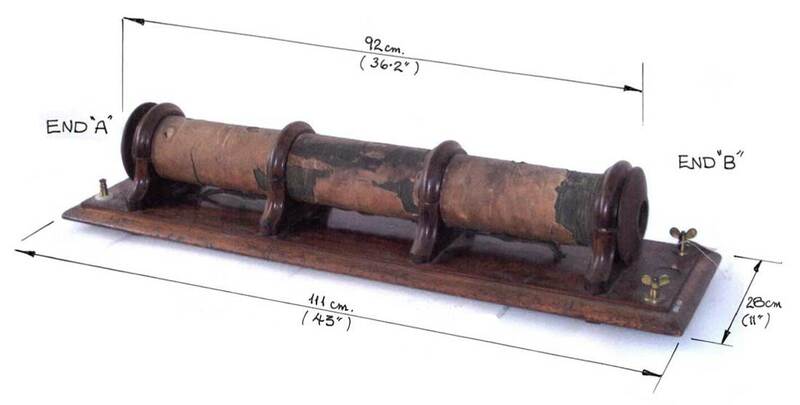 Allan Green is researching Whitehouse's life and work, and has discovered in the stores of the Science Museum, London, an induction coil from the 1850s which is similar to those used by Whitehouse on the cable. Allan provides some preliminary details on his research below. This coil, in the collection of the Science Museum, London, is presently in storage and was examined by Allan Green in August 2008. While this coil is similar in construction to those used by Whitehouse, its size (45" in length) does not correspond to the reported “5 foot coils” which Whitehouse used on the Atlantic cable, and none of the documentation relating to this coil mentions Whitehouse by name. The research is ongoing; if any site visitor has further information on Whitehouse's large induction coils please contact Allan Green via the Atlantic Cable website. See also Steven Roberts’ article on Whitehouse’s telegraph patents, which includes some details of his large induction coils.